The very first Startup Weekend DC event was hosted at Viget HQ in 2007, where 75 people pitched 13 ideas, only to agree on 1 startup idea to build over the weekend. Things have certainly changed since, and this past weekend, over 60 ideas were presented by 100+ attendees before agreeing on 16 ideas to pursue. Some things don't change though--Viget sponsored the event because we love meeting and supporting would-be entrepreneurs. Saad Ahmed and I had the opportunity to represent Viget and not only observe, but also participate and launch two separate startups over the intense, fast paced weekend. How is it possible to launch a startup in 54 hours? Read on! With over 100 would-be entrepreneurs thrown into a room, there was no lack of ideas. We heard an unbelievable 60 pitches and after an hour of listening to interesting concepts, each pitch leader had to solicit votes to get to the final round. In the end, 16 ideas gained enough votes to compete for Startup Weekend DC! Tip: Simple, inspiring, and problem-centric pitches will win over others at Startup Weekend. You can only cover so much in 60 seconds and if you can't explain your problem succinctly, it's bound to fall flat. Once the top ideas were selected, each team leader was in charge of forming a team within 30 minutes. A small percentage of folks gravitated to the ideas they wanted to work on for the rest of the weekend, but everyone else had to be cajoled and sold on an idea. As expected, developers and designers were hard to come by, and watching pitch leaders persuade a designer to leave one team for another was entertaining. Tip: Day job titles don't matter! A sales guy will end up doing project management work while a developer might contribute to marketing. With small teams working in close collaboration, tasks need to get done regardless of what you do outside of Startup Weekend. The best teams were able to quickly gain consensus on project direction and prioritize tasks. Team members had to be on the same page, and getting strangers to agree on a unified direction in less than 3 hours required exceptional communication, compromise, and patience. Those that were able make decisions sooner spent precious hours building instead of deliberating. Tip: Make decisions quickly and start building early. You can literally spend the entire weekend debating direction, but during Startup Weekend, every hour is precious. Don't waste time with endless debates. The most important constraint in a 54 hour weekend launch is just that: it's only 54 hours. Understanding this constraint, teams started building their apps immediately. The key to success during this phase is the Minimum Viable Product (MVP): the bare minimum needed to present and test your business hypothesis. Teams were busy planning, designing, and prototyping with the goal of presenting an MVP by Sunday night. Good teams were able to fight against feature creep, maintain focus, and showcase a solution to their business hypothesis during the final presentation. Tip: You have one goal: prove your concept by telling a compelling story. Don't bite off more than you can chew. Make realistic expectations, plan accordingly and move quickly. After an exhausting weekend of planning, designing, and building, teams had to hit a 5pm Sunday presentation deadline. Team leaders frantically assessed the functionality of demos, marketing team members added last minute research and data, and developers pushed code to production. We heard 16, 5-minute presentations that varied greatly, from "market research only" presentations to fully functioning iPad applications already submitted to the app store. Our panel of judges from local and global tech companies asked questions that ran the gamut, all in hopes of finding the "next big thing". Tip: Visuals, storyline, and a demonstration are a must for success, but to win, you need to have all three whilst tackling a unique business problem within a large target market. Weekly Eats, an application that helps you find recipes based on what's in your fridge, track how healthily you eat, and saves you money along the way, took home the grand prize. They also won the honor of representing SW DC in "Global Startup Battle", a world-wide competition amongst other Startup Weekend winners that runs until Monday, 11/28. Be sure to support them by voting! While neither Saad nor I were on the winning team, both of our teams received immense praise from the audience and judges. 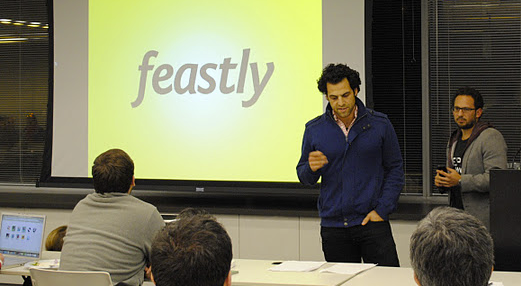 Saad, normally a sales guy, was the UX Designer and PM for Feastly, an app that connects passionate eaters with at-home cooks. And while I'm a marketing guy, I created the visual design, marketing videos, and product strategy for Kairos, a mobile app that allows users to experience the history around them through augmented reality.